The Chesapeake and Delaware Canal (C&D Canal) is a 14­mile long, 450­foot wide and 40­foot deep ship canal that cuts across the states of Maryland and Delaware. The C&D Canal is owned and operated by theU.S. Army Corps of Engineers, Philadelphia District. The project office in Chesapeake City, Maryland, is also the site of the C&D Canal Museum and Bethel Bridge Lighthouse. In the mid­17th century Augustine Herman, a mapmaker and Prague native who had served as an envoy for the Dutch, observed that two great bodies of water, the Delaware River and Chesapeake Bay, were separated only by a narrow strip of land. Herman proposed that a waterway be built to connect the two. The canal would reduce, by nearly 300 miles (500 km), the water routes between Philadelphia and Baltimore. More than a century passed, however, before any action was taken. In 1764 a survey of possible water routes across the Delmarva Peninsula was made. The issue of constructing the waterway was raised again in 1788 by regional business leaders, including noted Philadelphians Benjamin Franklin and Benjamin Rush. In 1802, following actions by the legislatures of Maryland, Delaware and Pennsylvania, the Chesapeake and Delaware Canal Company was incorporated. More surveys followed, and in 1804 construction of the canal began including 14 locks to connect the Christina River in Delaware with the Elk River at Welch Point, Maryland, but the project was halted two years later for lack of funds. The canal company was reorganized in 1822, and new surveys determined that more than $2 million in capital was needed to resume construction. Eventually the Commonwealth of Pennsylvania purchased $100,000 in stock, the State of Maryland $50,000 and Delaware $25,000. The federal government's investment was $450,000 with the remainder subscribed by the public. The U.S. Army Corps of Engineers recommended a new route with four locks, extending from Newbold's Landing Harbor (now Delaware City), westward to the Back Creek branch of the Elk River, Maryland. proved a great impediment to progress as workers continuously battled slides along the soft slopes of the "ditch" being cut. It was 1829 before the C&D Canal Company could, at last, announce the waterway "open for business". The near-$2.5 million construction cost made it one of the most expensive canal projects of its time. The Chesapeake Bay and Delaware River were now connected by a navigation channel measuring nearly 14 miles long, 10 feet deep, 66 feet wide at the waterline and 36 feet wide along the channel bottom. Locks to pass vessels through the waterway's various levels were constructed at Delaware City, Delaware and St. Georges, Delaware, and two at Chesapeake City. Teams of mules and horses towed freight and passenger barges, schooners and sloops through the canal. Cargoes included practically every useful item of daily life: lumber, grain, farm products, fish, cotton, coal, iron, and whiskey. Packet ships were eventually established to move freight through the waterway. One such enterprise—the Ericsson Line—operated between Baltimore and Philadelphia, and continued to carry passengers and freight through the canal into the 1940s. The cargo tonnage peaked in 1872 with more than 1.3 million tons transiting the canal. 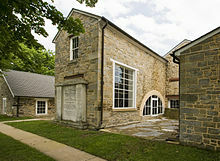 The U.S. Army Corps of Engineers operates the C&D Canal Museum at Chesapeake City, Maryland, housed in the original canal pumphouse with a waterwheel and pumping engines. Loss of water in the locks was a problem from early on. As boats passed through at Chesapeake City, the equivalent of a full lock of water was lost to the lower-lying portion of the canal. This loss due to locking vessels through the canal, compounded by leakage through the canal banks and normal evaporation, made it necessary to devise a means of lifting water into the project's upper part. A steam operated pump was purchased in 1837 to raise water from Back Creek and in 1852 a steam engine and largewaterwheel were installed at the pumphouse in Chesapeake City. Measuring 39 feet in diameter and 10 feet wide, the iron and wood waterwheel had 12 troughs which filled with water as it turned; the water then spilled over the hub into the raceway and into the uppermost canal level. By 1854 a second steam engine was in use. The two 150 horsepower (112 kW) engines consumed eight tons of coal daily while lifting 170 tons of water per minute into the canal. The waterwheel and steam engines remained in continuous use through the mid­1920s. Throughout the 19th century, steam power brought larger and deeper-draft vessels that could not pass through the restricting locks. By the turn of the 20th century the decline in canal traffic and great cost of operation and repairs brought a downward trend in canal profits. Clearly a larger, wider and deeper waterway was needed. At the time, however, little thought was given to improving the existing canal. President Theodore Roosevelt then appointed a commission in 1906 to report on the feasibility of converting the canal to a "free and open waterway". 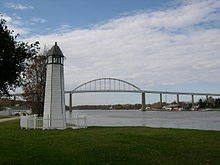 A full-sized replica of the 30­foot Bethel Bridge Lighthouse is located on Corps property, a short walk from the museum. The original lighthouse was used to warn vessels of locks and bridges in the days before the 1927 canal changes made it sea level. In 1919 the canal was purchased by the federal government for $2.5 million and designated the "Intra-coastal Waterway Delaware River to Chesapeake Bay, Delaware and Maryland". City) were removed and the waterway was converted to a sea-level operation at 12 feet deep and 90 feet wide. These improvements cost $10 million. Two stone jetties at the new eastern entrance were completed in 1926. The "new" canal opened in May 1927 with great celebration, yet plans already were underway for further expansion as the sizes of ships and amounts of cargo continued to increase. The Philadelphia District took over operation of the canal in 1933. Between 1935 and 1938 the channel was again improved — deepened to 27 feet and widened to 250 feet at a cost of nearly $13 million. The project was also expanded to include a federal navigation channel 27 feet deep and 400 feet wide for some 26 miles in the Upper Chesapeake Bay, from the Elk River to Pooles Island. Through the years, as the sizes and tonnages of ships using the canal continued to grow, accidents and one­way traffic restrictions strained the canal's capacity. Between 1938 and 1950 alone, eight ships collided with bridges. In 1954 the United States Congress authorized further expansion of the channel to 450 feet wide and 35 feet deep. These improvements began in the 1960s and were completed in the mid­1970s. Thus the Chesapeake and Delaware Canal approached 175 years of service as a vastly improved waterway, far different from its 19th­century predecessor.